The San Francisco Planning and Public Health Departments, along with the Bay Area Air Quality Management District, are preparing a draft San Francisco Community Risk Reduction Plan, a comprehensive and citywide plan to protect human health from these negative effects of air pollution within San Francisco. Air quality in San Francisco varies throughout the city depending on geography, meteorology, and land uses. While most areas of San Francisco experience good air quality, some areas, such as those close to freeways, maritime activities, and industrial activities, experience higher levels of air pollution. Exposure to higher levels of air pollution can lead to often preventable health problems such as increased illness and premature death from asthma, bronchitis, emphysema, pneumonia, coronary heart disease, abnormal heart rhythms, congestive heart failure, and stroke. Reduce the health impacts of air pollution citywide, particularly for vulnerable populations. The City and Air District conducted early outreach presentations in August 2017. The draft plan is expected to be released in spring of 2018, after which there will be further outreach. Draft documents will be posted on this webpage as they are available. How is the City Currently Addressing Air Pollution Exposure? The City and County of San Francisco has long been a leader in protecting residents' public health. 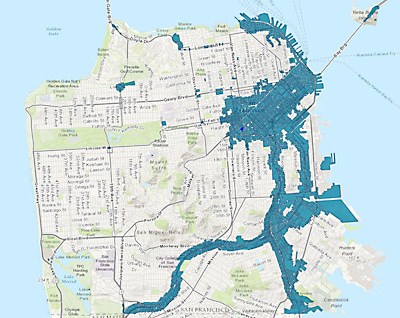 In 2008 (amended in 2014) San Francisco Health Code article 38 was adopted to require new residential construction projects located in areas where models show poor air quality and pollution from roadways (the Air Pollution Exposure Zone, or APEZ) to install enhanced ventilation to protect residents from the health effects of living in a poor air quality area. Click here for larger, detailed map. Construction Dust Control Ordinance: In July 2008, the City adopted an ordinance to reduce the quantity of dust generated during site preparation, demolition, and construction work in order to protect the health of the general public and onsite workers, minimize public nuisance complaints, and to avoid orders to stop work by the Department of Building Inspection. Clean Construction Ordinance: In April 2007, the City adopted an ordinance requiring public projects to reduce emissions at construction sites starting in 2009. In March 2015, the City expanded the existing ordinance to require public projects to further reduce emissions at construction sites in certain areas with high levels of background concentrations of air pollutants. Greenhouse Gas Reduction Strategies: The City has developed a number of plans and programs to reduce the city's contribution to global climate change and meet long-term climate stabilization goals. The City's 2013 Climate Action Strategy is the most recent, and documents the City's actions to pursue cleaner energy, energy conservation, alternative transportation, and solid waste policies, which serve to reduce air pollution in addition to greenhouse gases. The City is currently developing an update to the greenhouse gas reduction strategy. Transportation Demand Management Program: In February 2017, the City adopted an ordinance to establish at transportation demand management program, requiring developments to provide on-site amenities that support sustainable modes of transport and reduce single-occupancy driving trips associated with new development. Bicycle Plan: The 2009 San Francisco Bicycle Plan contains specific proposed near-term bicycle route network improvement projects for a safe, interconnected bicycle network that supports bicycling as an attractive alternative to private auto use. Better Streets Plan: The Better Streets Plan, adopted in 2006, created a unified set of standards, guidelines, and implementation strategies to govern how the City designs, builds and maintains its pedestrian environment. The plan promotes streets designed to promote walking, cycling, and transit use over single occupancy vehicle use, which will reduce local air pollution and San Francisco's contribution to global climate change. Green Taxi Fleet: The green taxi program, established by ordinance in 2008, set aggressive emission standards and supported the conversion of private fleets with grant incentives. In 2012, the city exceeded the ordinance goal of reducing the average per-vehicle greenhouse gas emission by 20 percent from 1990 levels by 2012. As of 2012, 92 percent of the taxi fleet is composed of hybrid or CNG vehicles.